Have you heard the term “Superfood” when referencing a food’s nutrition benefits? “Superfoods” are as trendy as “fat-free” foods were back in the 90’s. It seems like the word “fat-free” was slapped on everything it could be…everything short of an apple. But we all know where the fat-free craze got us…. Excess sugar in our goods. Gogi Berries. A packaged Superfood. Sweet. These are the guys I am talking about. Good stuff. In a bag. Long shelf life. No worrying about buying in season. The reason I will promote this “Superfood” is because they do have pretty awesome health properties. Similar to berries, but no fuss or worrying about them rotting or going bad. No refrigerating required. Here is the deal. Before gogi berries are packaged, they are dried out almost completely and left with about 10% moisture. This gives them their chewy consistency. And although gogi berries look like little red raisins, they are not quite as sweet. But with Vitamin A, C, and Iron? Who cares. Way healthier than a raisin. 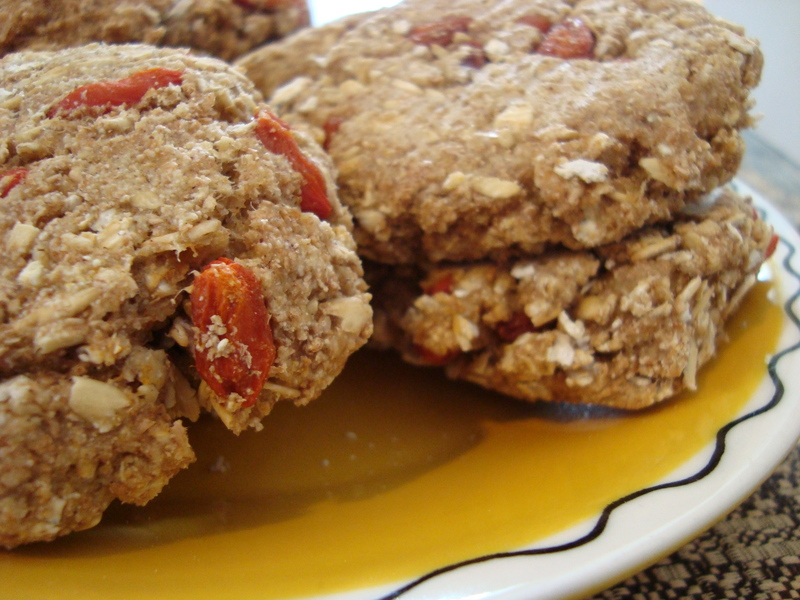 My gogi berry and rolled oat cookies from a while back. See those red guys?? These are gogi berries. 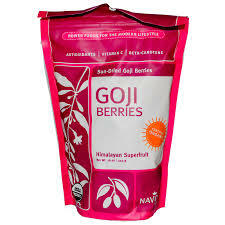 According to the Navitas Naturals website this is what they say about their gogi berries and their nutritional content: “Ounce-for-ounce, goji berries contain more vitamin C than oranges, more beta-carotene than carrots, and more iron than soybeans and spinach.” That’s quite a nutritional claim. I’m on board with that. What to do with these babies? Keep them in your purse in place of those almonds you have been carting around for a week. Mix it up a bit. Add them to your salad. Top your oatmeal with them. Add them to your cookie recipes?? See above picture :). 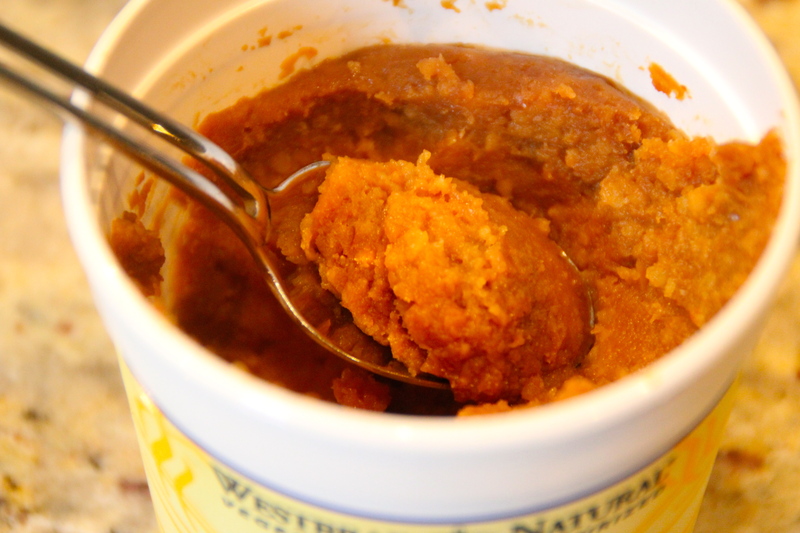 Do you know about miso paste? Chances are if you have ever been to sushi, you have had miso soup. 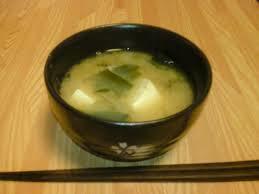 Miso soup has miso paste. Same stuff, different format. Do you do miso soup? If not, crawl out from under your rock and get to the nearest sushi place, okay?? You’ll thank me. Fermented soybean paste. Super common in the Japanese culture and used to add flavor in dressings, marinades, and yes, miso soup! A sweet, salty taste. An oxymoron I know, but try it, you’ll understand. 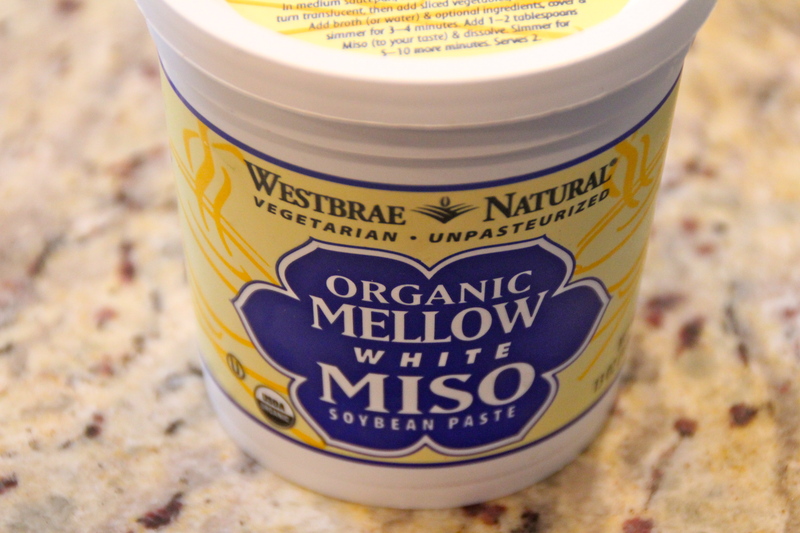 Why should you make friends with miso paste? Best part? It is a probiotic. Meaning: aids in digestion and boosts immunity. Where can I find this at the grocery store? The refrigerated section of your health foods store. 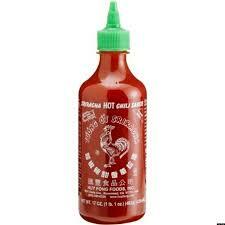 Unfortunately, Trader Joe’s does not have this stuff. Yet. Don’t push this to the back of the fridge. Give it a home in the front door. Have you seen these flaky sheets of awesomeness? These babies are surprisingly tasty. The first time I picked these up I was intrigued. 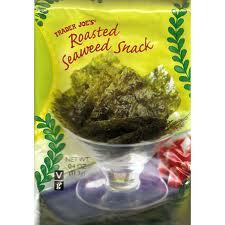 Of course I had eaten sushi plenty of times, but roasted seaweed? As a snack? My first try was the Trader Joe’s brand. But what is it?? Fishy stuff? Put simply: it is algae. The gunk in a pond? 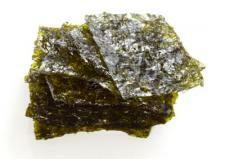 This is marine algae. Or a sea vegetable. 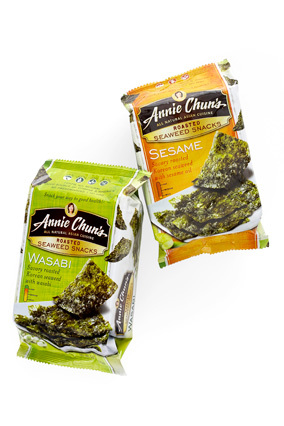 I have since graduated to Wasabi Seaweed Snacks. Love that kick! I challenge your Wheat Thins to those stats. These show up in my kids lunch bags on a semi-regular basis. Wish the packaging was a tad smaller. Such problems…. One caveat: Check your teeth post-consumption. Sometimes little chunks get in the old gum line. Wouldn’t want to scare away the UPS guy or any co-workers. Kimchi. 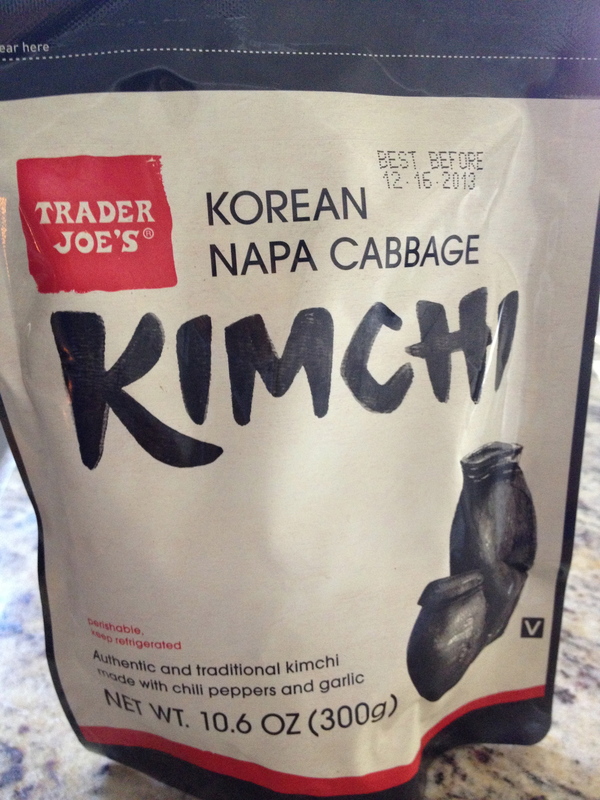 A Korean staple that should be an American staple. And what the heck is it? Fermented vegetables. Vegetables already make it a winner. Trader Joe’s brand comes in this handy pouch. Why eat onion, cabbage, and radish that have been soaking in vinegar?? Well for the same reason you have been told to eat your yogurt. Digestive health. Fermented foods such as kimchi contain healthy bacteria called, lactobacilli which helps aid in digestion. Always good to keep things “clutter free”. 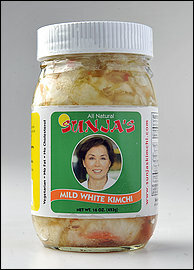 Other stores like Whole Foods sell kimchi in a jar. How do you eat the stuff?? Well, it can basically be served on the side of pretty much anything. On a sandwich. On a salad. In a wrap. Alongside a rice bowl. Anything! It’s really good stuff. Give it a shot. Let me know what you think.